When Frank Sinatra crooned about the magnificent Chicago, the city was well on its way to becoming the third-largest (by population) city in the United States. A midwestern metropolis known for its pizza, lakeside location and fervent sports fans, it attracts hordes of tourists from around the country and abroad. However, Chicago is much more than simple shopping on Magnificent Mile, a trip to the Field Museum and pizza at one of the several pizzerias that claim the invention of Chicago-style (though there’s certainly nothing wrong with any of these, and all should be experience at least once). Chicago’s vibrant neighborhoods, culinary scene and unique attractions stretch beyond its most famous street, offering a travel experience that’s attractive to just about any kind of traveler, from budget to luxury, single to multi-generational, business to leisure. A short cab ride from the Magnificent Mile, or a much longer walk, if you’re in the mood for a stroll, the Lincoln Park neighborhood is still popular enough with visitors to provide all the quick amenities you might want or need, but less crowded overall. The Lincoln Park Zoo is a free attraction that’s enjoyable any time of year, with beautiful views of a portion of the skyline. Right next door is the Lincoln Park Conservatory, where you’ll spot thousands of plants under the glass dome, from the most commonplace to tropical varieties. While in the area, grab a sweet treat at Molly’s Cupcakes, acclaimed as one of the 10 best cupcake bakeries in the country and winner of Food Network’s Cupcake Wars. About a half-hour cab ride from downtown, it’s not recommended you walk to Wrigleyville if you’re staying on Magnificent Mile. However, it’s well wroth a visit. If you’re not in town while the Cubs are in season, you can still visit Wrigley Field for a tour of the historic attraction, built in 1914. Across the street, the newly opened Hotel Zachary boasts some amazing eateries and bars, such as Mordecai, Whiskey & Grill, a bi-level cocktail bar and restaurant with craft cocktails. Westtown Bakery is a super-local, super-sustainable and super-green bakery serving up cakeballs, other bakery items and diner-inspired fare. For music-lovers, Metro offers an impressive lineup of indie and alternative rock acts, such as GroupLove, Bishop Briggs and more. Beyond the pizza, Chicago is known for its hot dogs. A Chicago-style dog is often a high-quality dog with a poppy-seed bun, mustard, onions, relish, a pickle, tomato spears, pickled peppers and some celery salt. You can find two great hot dog options in the University Village neighborhood. There’s the regional chain that’s still beloved by many, Portillos, and then the one-of-a-kind Jim’s Original, with its 24/7, vintage stand feel, serving up Polish sausages since 1939. For research’s sake, try both and compare. 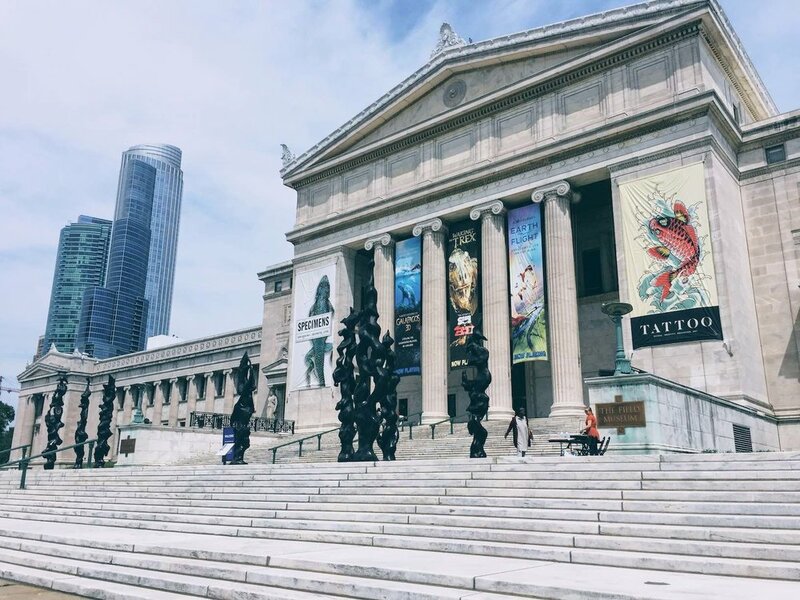 South of the Central Business District, Near South Side offers quite a few attractions, from the Shedd Aquarium to Soldier Field. Both can get pretty packed if you’re visiting at the right time, but there are less-popular, but still-worthy museums in the area as well, such as the Glessner House Museum (featuring Chicago’s oldest building) and the Clarke House Museum (featuring Chicago’s oldest surviving home, built in 1836).